We all like to smell good, so using deodorant is a must! However, most conventional deodorants contain a slew of toxic chemicals, such as aluminum chlorohydrate, parabens, propylene glycol, triclosan, TEA, DEA, FD&C colors, and Talc, among others. Click here to read more about the dangers of using store bought deodorant. I learned about this a few years ago and have made my own deodorant ever since. I am fairly active and workout regularly and I have never had an issue with my deodorant not working as well as store bought brands. 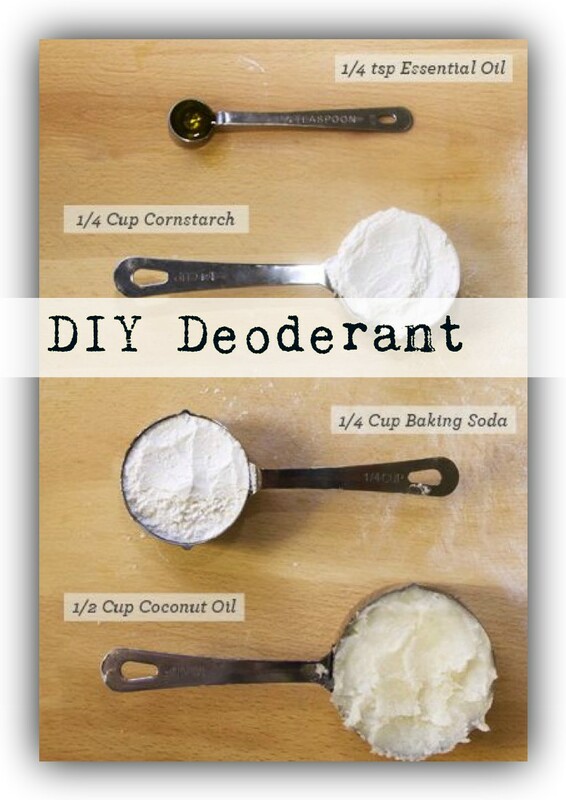 If you would like to ditch your store bought deodorant too, here is an easy recipe to try! Mix all together and store in a cool spot in your bathroom. When the weather gets warm and your house warms up, this will liquefy a little bit from the coconut oil but you just have to throw it in the fridge or freezer to cool it down again.